The biggest thing about a small town is the secrets it carries. Tristan is the captain of the basketball team. He is poised to be a member of the All-American team, along with a full ride to UCLA on a basketball scholarship. While his girlfriend, Annie, is happy for him, she’s also saddened at the idea of losing him to UCLA next year. A break in at a local pharmacy sparks an investigation–and Tristan’s truck is searching finding stolen pills (steroids) as well as an empty bottle of vodka. Tristan swears he didn’t do it, but UCLA wants to red-shirt him and the All-American team is not interested. Tristan and Annie work separately to try and figure out the puzzle–who would want him off the All-American team AND want him to sit out of college ball? Annie’s investigation is only half-hearted–the bottle of vodka was hers. More specifically, it was her parent’s bottle of vodka that she drank. The watered down vodka helps her focus at school and calm her anxiety. But Annie can’t tell anyone, especially not her older brother, Wren, as he’s the head of the school paper. When Rich, another player from the team, approaches her to tell her he knows it was her bottle, she is despondent, but agrees to go on a date with him to keep her secret. Will Tristan find out about Annie’s extra-curricular drinking and dump her? Will Annie figure out who was behind the crime? Will Annie be able to keep her date with Rich a secret from Tristan? I really enjoyed the pacing of this novel. It felt well plotted and real-to-life. I felt like author Emily Kazmierski really cared about cultivating this novel and it shows. I want to know more about the characters and see what else they go through in the future. 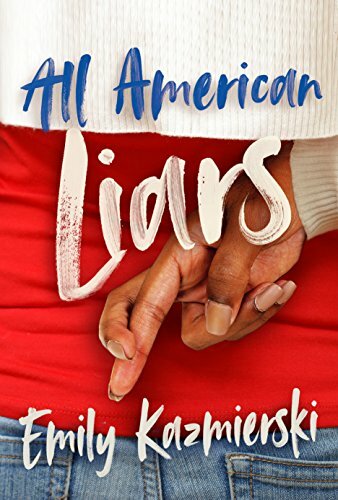 All-American Liars is available now, in your favorite format. I received an electronic copy in exchange for my honest thoughts.